American Receivable's Pam Rodden made an impressive showing when she participated in this year's Lady Bass Anglers Tournament held at Lake Ray Hubbard. Despite challenging conditions all three days the tournament was a complete success. The Lady Bass Anglers Association traveled to Texas' beautiful Lake Ray Hubbard for the third Lady Bass Classic to conclude the 2013 tournament season. With 21,61 acres of water, Lake Ray Hubbard is located in Collin, Dallas, Rockwall and Kaufman counties. It is located one mile west of Rockwall on the East Fork of the Trinity River. This event was hosted by the Garland Convention and Visitor's Bureau. The field consisted of the top twelve anglers in both the professional and co-angler divisions plus one wild card berth from each division, and two in each division from the Red River Wildcard Tournament. All told, a minimum of a fifteen angler field competed in the event for the championship title, cash and prizes. Unlike other events during 2013, this event had anglers competing for three days. Each of the three days anglers competed to bring in the heaviest stringer for their respective divisions. Five for professionals and three for amateurs each day of the competition looking for the highest cumulative three day total weight. 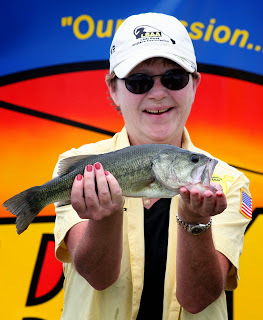 The angler with the largest three day weight was crowned the second Lady Bass Classic Champion. One angler in each division was also awarded a cash prize for the biggest bass of the tournament. Cash payouts in each division were paid to anglers competing in the tournament. American Rceivable Corporation www.americanreceivable.com is a proud sponsor of The Lady Bass Anglers Association. American Receivable Corporation provides financing programs for companies experiencing cash flow problems. For over 35 years they have helped businesses large and small find solutions to their financing needs.